You are here: Home / Kids / Make the Guinness Book of World Records! If you have kids who love to have fun then this is the perfect way to not only make memories with your kiddos, but make HISTORY with them! To get all the details on the fun, freebies, and this super kid friendly attempt to make the GUINNESS WORLD RECORDS™ read on below! This post is in partnership with Chuck E Cheese as a part of the Chuck E Champions Ambassador program. All the stories, thoughts, and experiences below are my actual family! Making memories is the name of the game when you have crazy schedules and little ones that are growing up in the split seconds that you spend blinking your eyes. There are so many little things you can do every day to create traditions and make memories, but every once in awhile something really cool pops up that is guaranteed to be a fun memory for the kids and I have a super fun activity to share with you today! 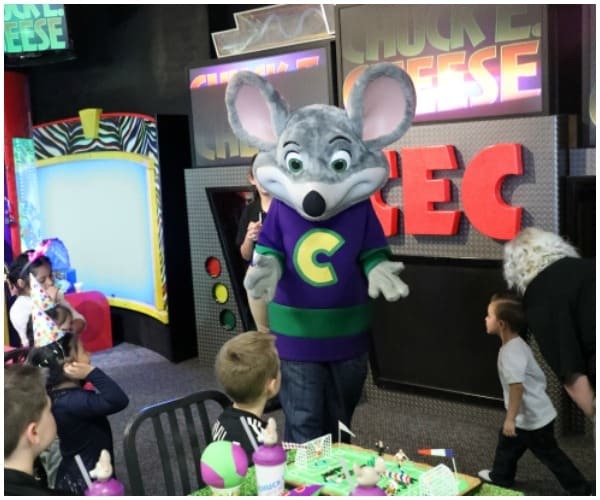 It’s Chuck E Cheese’s 40th Birthday and to celebrate Chuck E and friends are not only throwing a pretty epic party, but also showing your with fun and freebies! To celebrate it’s 40th Birthday, Chuck E. Cheese’s and friends have teamed up with GUINNESS WORLD RECORDS™ to attempt A GUINNESS WORLD RECORDS™ title in stores nationwide on May 19 and YOU are invited! This Friday, Chuck E. Cheese’s will be attempting to make a new world record with the help of kids all over the country. Families are invited to visit their local Chuck E. Cheese’s to be a part of the “Most People Blowing Party Blowers Simultaneously for 10 Seconds” world-record breaking event. Plus, every child that comes in on May 19th will receive a free slice of cake and 40 free tickets, while supplies last, regardless of participation in the record-breaking stunt. Here are all the details because YOU are invited! When: Friday, May 19th at 8:40 PM EST / 7:40 CST / 6:40 PM MST / 5:40 PST. Important- Make sure to arrive 30 minutes prior to participate in the record making event! Where: Your local Chuck E Cheese! Find your nearest Chuck E Cheese here! Why: Have fun, make memories AND History with your kids! Plus, as a bonus, every child that comes in May 19th will receive a free slice of cake and 40 free tickets, while supplies last, regardless of participation in the record-breaking stunt. Visit The 40 Years of Fun website for more info and details on the events and special promotions! In addition to this fun event, Chuck E. Cheese’s is hosting a daily sweepstakes to celebrate 40 years of fun. In the 40 days leading up to the milestone on May 19, Chuck E. Cheese’s will grant unsuspecting fans a chance to win a free VIP birthday party experience. To enter, fans can upload an image of their receipt showing that they visited a Chuck E. Cheese’s between 4/10 and 5/19 for a chance to win the VIP party for up to 20 kids. Kids can also get 40 free tickets with a minimum purchase of $5. Kids love Chuck E Cheese’s and Parents love the ease of planning, prep and clean up for the party! Online reservations makes planning the party take only minutes! Specials for the birthday kid, include things like 1000 bonus tickets for the birthday kid, a trip to the ticket blaster, special singing and dancing with the Chuck E Cheese crew, and more! Different party packages give you options to fit your kid! The new Eat More Play More package is geared for kids 8+ and gives each kid 3 slices of pizza and even more play time which was perfect for our son and all his rowdy friends this year! You can get everything from fun themes, to invitations, to food, to fun, to cakes and even party favors! You don’t have to lift a finger if you don’t want to! The staff will have everything running seamlessly from the time you invite the guests to the time everyone heads out the door with their goodies. I hope you will have a chance to stop by on Friday and join us for the fun and hopefully record making evening of fun! Remember to grab all the details and discounts on the 40 Years of Fun website here. Let me know in the comments if you have had a party at Chuck E Cheese or if you think you can join us for the fun on Friday!